Packed with fun things to do: colouring, doodling, and other activities. Includes 250 stickers plus card press-out pages with bookmarks, characters, and more! Ages 3-6. 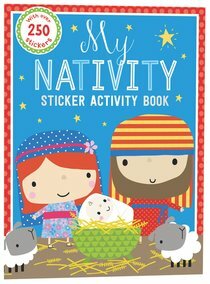 About "My Nativity Sticker Activity Book (4 Pages Stickers)"
:A nativity-themed activity book, with card press-outs and over 250 stickers, which is ideal to help engage and entertain young children . This nativity-themed sticker activity book is packed with fun things to do, from colouring, doodling and sticking to activities and games. Over 250 stickers are included, and at the back of the book there are card press-out pages for even more enjoyment beyond the book. The press-out pages feature bookmarks, characters and more! This is a beautifully illustrated book, combining the Christmas story with fun activities for young children.